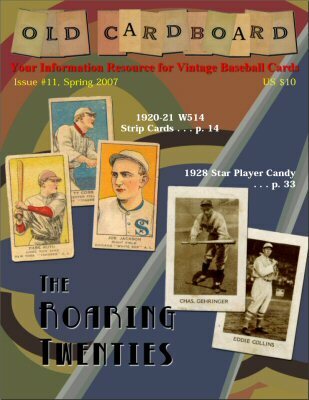 The cover and the table of contents for Issue #11 are shown below. 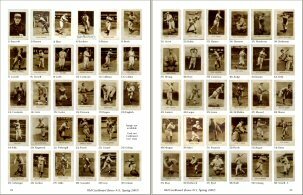 1) "Historic 1920-1921 W514s: The 'T206' of Strip-Card Sets" by Ted Golden. 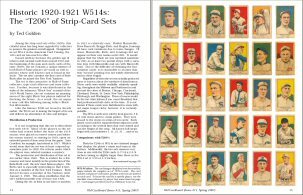 A favorite among strip card collectors, this important set has parallels to the T206 issue from a decade earlier. 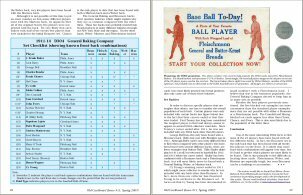 The W514 set boasts cards for seven of the eight players banned from baseball after the Black Sox scandal of 1919, as well as the earliest card of Babe Ruth as a Yankee. Article includes a full gallery and numerous previously unpublished set details. 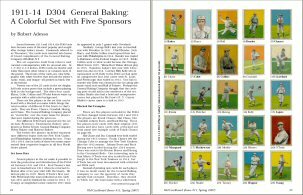 2) "1911-14 D304 General Baking: A Colorful Set with Five Sponsors" by Robert Adesso. Collector Adesso documents his study of this colorful bakery set with emphasis on the five different bakeries (or their brands) featured on the card backs. 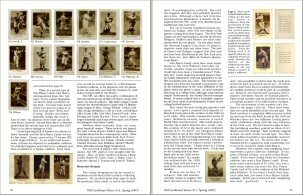 Included is a full set gallery and a detailed cross-checklist showing all of the front-back combinations documented so far by the author. Set rarieties, variations, and ad pieces are also discussed. 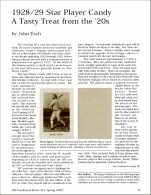 3) "1928/29 Star Player Candy: A Tasty Treat from the ‘20s" by John Esch. 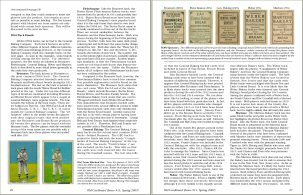 Third-time Old Cardboard author Esch examines the mysteries of this issue curious set of relatively crudely printed sepia cards. 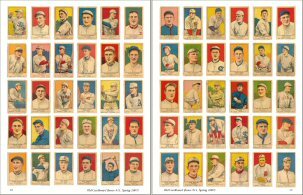 The recent addition of a card for Buddy Myer casts new doubt about the number of cards that the set actually contains. The article includes a set gallery, a discussion of the "second type" of Star Player Candy cards, and more. 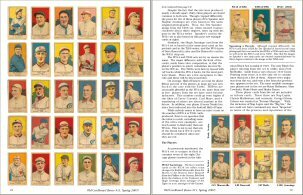 4) "T206 Wagner Brings $2.35 Million; Sets New Record for Baseball Card" by Old Cardboard Staff. 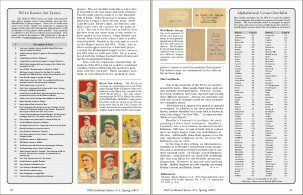 A recent announcement of the sale of the "Mona Lisa of all trading cards" triggered the development of this fact-packed two-page overview. 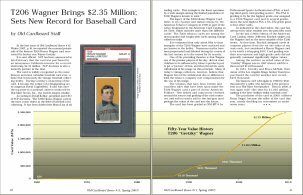 Included is a hi-res full size image of the graded card, a plot that traces the value of the card over the past fifty years, and other facts and lore about the world's most famous baseball card. 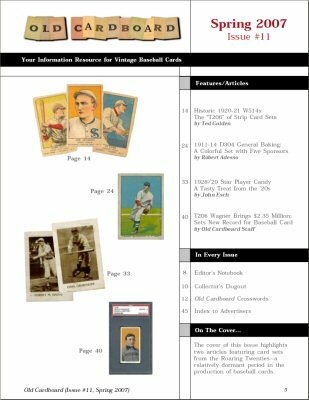 In addition to the above articles, all issues of Old Cardboard magazine include regular sections for Editor's Notebook, Collector's Dugout, the baseball and baseball-card-themed Old Cardboard Crosswords, informative messages from our sponsors, and more. To order your copy of this and other issues of Old Cardboard, go to subscription details.